A cooking challenge organized by Meg of Grow and Resist and Briggs of Oh Briggsy in which we explore a featured cookbook each month. The selection for March is Becky Selengut’s Good Fish, Sustainable Seafood Recipes from the Pacific Coast. I’ve always lived near bodies of water that were fishing grounds. Although I grew up near Lake Erie, the memorable fish of my childhood came from adventurous places where my father would go with his buddies or my brothers. They’d drive or fly to some remote lake or river up in Canada and come back with fresh-water fish like muskellunge or arctic char, or even river salmon during special seasons. When I went off to school in New England, I became acquainted with the finfish and shellfish of the sea: setting lobster traps, having clambakes, eating “scrod,” and enjoying the perceived endless bounty of the Atlantic Ocean. Meanwhile, my father moved the family to the Eastern Shore of Maryland along Chesapeake Bay and spent a couple of “gap years” between other things as a dayboat fisher of oysters and crabs. The family would gather at Christmas to feast on a bushel of oysters from his friends on Tilghman Island, and in the summer, we’d sit around picking a bushel of crabs. Around that time, I moved to New York and New Jersey, where you seemingly can get whatever food you crave, from wherever in the world you can imagine, whenever you want. I eventually realized that, while fun, it’s not a good idea. As I instinctively knew from my father, who was a consummate fisher, hunter and farmer, natural food is seasonal and regional, and fish are no exception, whether they migrate or not. As a world of citizens, we are depleting our oceans and ravaging our land with just plain bad fishing and farming practices. It’s like the pollution of Lake Erie and the Love Canal on a global scale. I’m devoted to responsible farming, with a preference for organic methods, so why shouldn’t I apply that same logic to fish? Especially since we eat more fish at home than poultry or meat. That’s why I whooped hooray when Meg and Briggs put Becky Selengut’s Good Fish on the list. Even though the book is based on Pacific Ocean fish, the word “recipes” in the subtitle conveys that the book is about ways of cooking fish, which are probably transferable to East Coast fish. And the book proves that true. It also offers useful advice about what fish to buy, when, where and why. And then how to cook it respectfully and effectively. Cod poses a dilemma these days since it’s been over-fished. Individual Atlantic fishermen are clamoring for restrictions on commercial fishing for cod. That’s a far cry from the “fish that changed the world” that Mark Kurlansky writes about in the book, Cod. His book was seminal telling a historical tale of politics, economics, the environment and gastronomy, a multi-faceted overview that led a genre of anthropological writing (think of books named Potato, Salt, or Tulip). Recently, Paul Greenberg’s Four Fish (bass, cod, tuna and salmon) addresses the sad future of our “last wild food.” I carry this around on my iPad and read it when stuck in airports or on trains. It’s no surprise that it’s among the books in Becky Selengut’s bibliography. So is the highly recommended Fish Without a Doubt by Rick Moonen and Roy Finamore. Now, after that long-winded introduction, what did I cook? Selengut features black cod (sablefish) and Pacific halibut, so I looked at recipes in those sections for what might work for my cod, a thick filet that could be sliced into steak-like pieces. 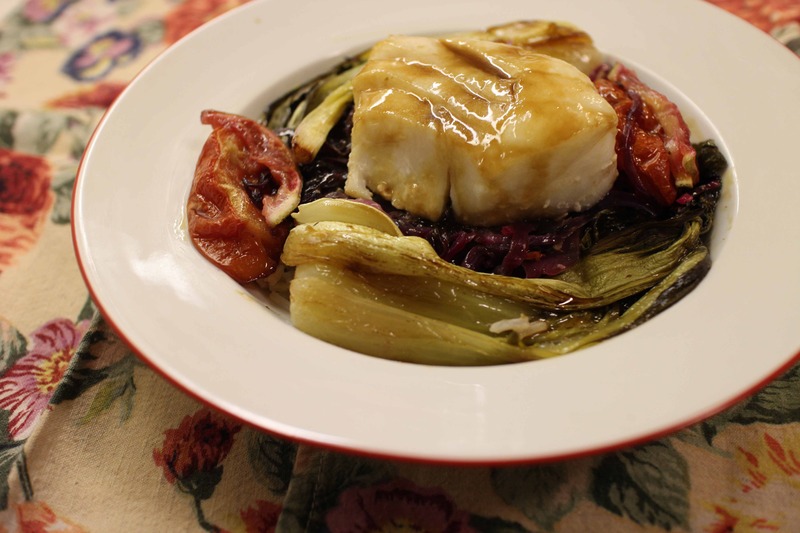 Based on what else was in my refrigerator, I made a version of Roasted Black Cod with Bok Choy and Soy Caramel Sauce (page 137). Once Selengut stated, “This dish is all about the sauce,” and “The soy caramel upstages them all,” I was in. Since Atlantic cod is milder and leaner than Pacific black cod, I knew that this would be successful because of the sauce. 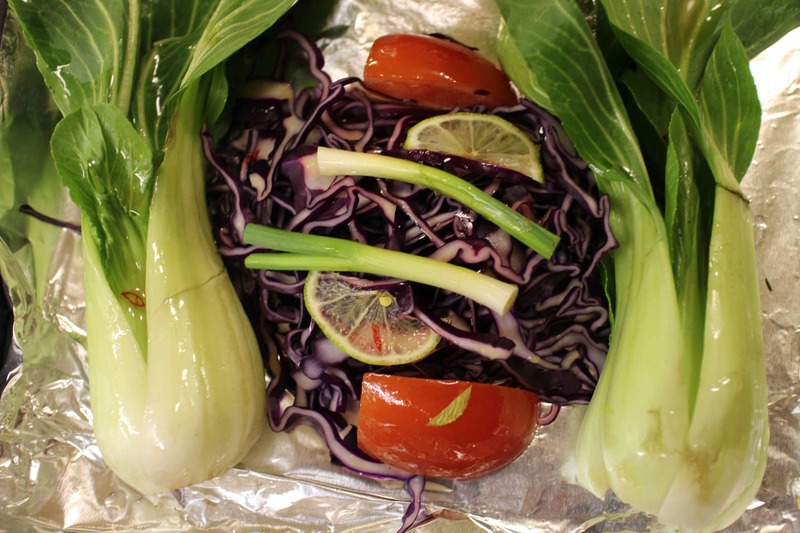 Made like a beurre blanc from a base of soy sauce, sake and mirin, the soy caramel was amazing and unified what might otherwise have been an odd combination (fish, red cabbage, bok choy and tomatoes, really!). I’d make this sauce again, fish or no. 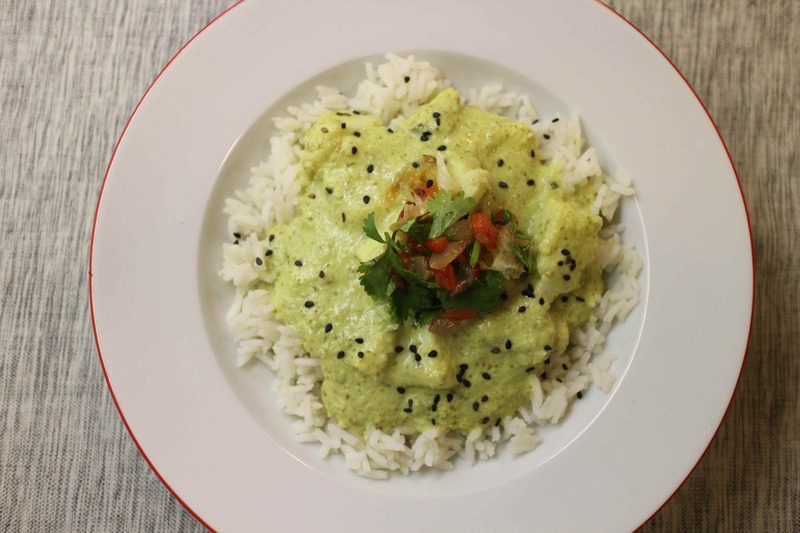 Then, since I had a big bunch of cilantro from my chowder adventure, I decided to make Halibut Coconut Curry with Charred Chiles and Lime (page 123). Because of its texture, cod substituted well for the halibut, and the green curry sauce was terrific. 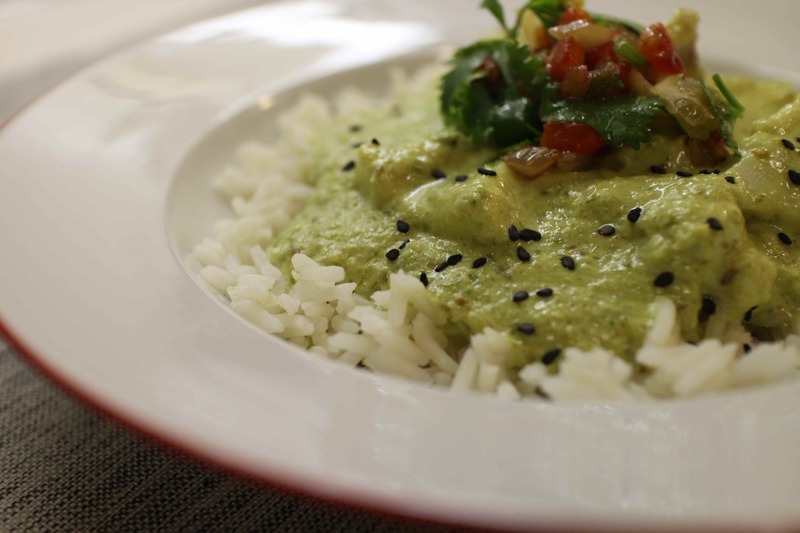 I wimped on the amount of jalapeno (don’t) and lessened the amount of coconut milk (do). As with the soy caramel, I’d make this sauce again, fish or no. That’s my fish story of the day. I can see myself cooking my way through a good deal of this book, so thanks to Meg and Briggsy for bringing it to our attention. P.S. Since I wrote this, I’ve experimented with more recipes from the book, which I’ll post later. I am so impressed! Love your thoughtfulness and thank you for sharing your history! Looks great!